I really wish I'd heard of them sooner. Let's skip a bit of my bemoaning the past. Today's album is a classic album regrooved. That means instead of simply re-releasing the album, they re-recorded it. It was felt that the first time through didn't capture the music. In the 90's, death metal often had terrible production....even when it was done well. 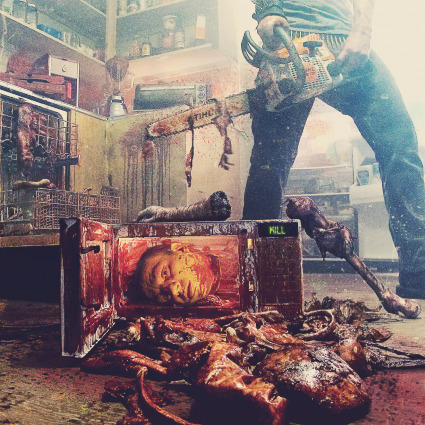 This album starts off with rusty chainsaws sawing off heads...I mean guitars. It starts off with Mesa/Boogie driven high gain and it just blows up from there. Vocally, there are three or four deliveries used on this album. From the standard Tampa Bay Growl to Carcass like screeches, and more. It's possible for death vocals to get a bit corny, but that was never the case on this album. The guitars are great. From over the top solos, to harmony breaks, to the riffs themselves. Exhumed wrote a great album where each song sounds different than the one before it. 2) Mesa/Boogie high gain is better than Peavey 5150 High Gain.